Involving yourself in martial arts can help you learn discipline, focus and persistence. However, one of the most important things martial arts can teach you is self-defense: learning how to get past an attack and keep fighting. The primary goal in any altercation is blocking the opponents’ attacks in order to avoid getting hit. But what if there was a more efficient way to avoid getting hit while also opening up your opponent to counter attacks? This is where the ‘checking hand’ comes into play. 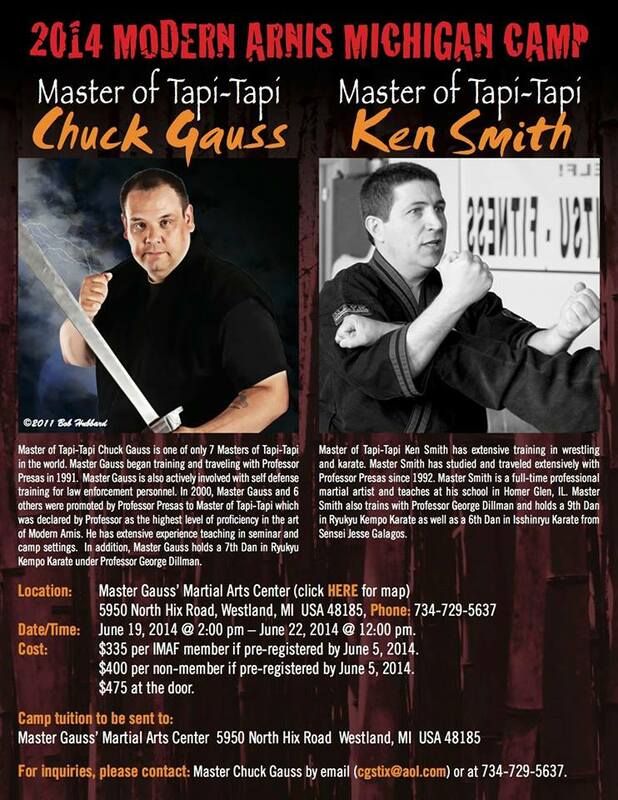 The Michigan Modern Arnis Camp was held recently this past June at Master Gauss’ Martial Art’s Center in Westland, MI. This year, students were privileged enough to get the opportunity to train with not one, but three Masters of Tapi-Tapi: Master Chuck Gauss, Master Ken Smith and Master Gabriele Roloff. Combined, the three of them have nearly a hundred years of experience in Modern Arnis alone, not considering the other martial art styles in which they are all additionally trained. Their knowledge and hands-on experience in combat fighting is unquestionable, and when it comes to the checking hand, the three of them are nothing short of Masters. So what exactly is the ‘checking hand?’ Well, it would be incorrect to say it’s just a way of blocking. “I think the checking hand is the live hand that keeps everything in perspective of blocking, stopping, checking, intercepting, striking… the checking or live hand Professor Presas said was key,” said Master Chuck Gauss. The checking hand is a way to bring the fight to your advantage in addition to protecting yourself from attack. The checking hand is not simply a lighthearted suggestion to martial artists, “it is the difference between winning and losing in a fight,” said Master Ken Smith. The checking hand is especially vital to those who train in Modern Arnis. “We use the check hand inside our tapi-tapi techniques. ‘Block, check, counter’ means that I block and I grab the weapon and counter. Rather than just blocking the attacking strike and countering, my check hand is in the middle of that controlling the weapon so he (the attacker) can’t use it against me,” said Master Ken Smith. The concept of the checking hand and how to use it also stays the same when weapons are brought into play. “When you have a weapon, you have a check hand,” said Master Gabriele Roloff. “One hand has the weapon, the other hand is checking.” In addition, Master Gauss suggests that even if you have weapons in both hands, the checking hand is still possible with the weapon as an intercept and a strike. For those who overlook the checking hand as a simple tap to redirect an attack, this is not always the case. Though a slight tap may knock an attack off-line, a powerful check will ruin your opponent’s stance and ultimately disrupt their body mechanics. This is why having a powerful checking hand can make or break a fight. The checking hand may be vital to martial artists in Modern Arnis, but it can also be a helpful tool to any martial artist training in combat. Opening up your opponent to counter attack in addition to protecting yourself is an incredible skill to have. The goal when fighting is to avoid getting hit and to be able to walk away afterward. It is Remy Presas’s belief, and ultimately the belief of his students, that the checking hand is a lifesaving tool that can be beneficial to any and all martial artists. Arnis Fest occurred recently, Nov. 10-12th in Homer Glen, IL. Arnis Fest is a three-day martial arts camp consisting of 18-20 hours of total training. 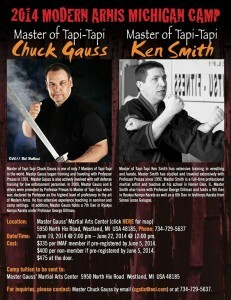 The camp (that hosted students from all over the country) feature Masters and Grandmasters of varying martial art styles, coming together to teach students techniques, counters, fighting, and more. This year, students had the privilege of working with Masters of Tapi-Tapi Chuck Gauss and Ken Smith, Grandmaster Will Higginbotham, and Master Earl Tullis. Higginbotham the profound martial artist he is today. “I’m a teacher now from having absorbed all the things I got out of seminars and camps,” Grandmaster Higginbotham said. “Regardless of your instructor, you need spread your wings and diversify… Diversity of training is terribly important. No one person can think of everything.” In addition, traveling and training with other students can give you a reflection of your own skill, “It’s paramount [to train with others]. Because it gives you self-gratification of where you’re at as a measuring stick,” Said Master Chuck Gauss. Earning the title ‘Master’ or ‘Grandmaster’ takes a lot more than just a lifetime of training. It takes discipline, understanding, diversity of training, and modesty. Grandmaster Steve Stewart says, “learn from everyone, not just owners, but students… I’ve learned things from white belts.” Everyone sees things differently, and everyone teaches differently; it is essential for anyone striving to be a great martial artist someday to broaden their horizon and learn from/practice on as many people as possible. “If you don’t [attend camps] you’re doing yourself a disservice. You’ll never be a whole martial artist,” said Grandmaster Stewart. Training as a diverse group helps students learn and grow from each other. This is a life-long journey, and no one is on this journey alone. Share your experience and skill with others, and let others share the same with you, regardless of rank, martial arts style, or anything else. Here’s a teaser clip for this year’s Michigan Camp, taking place June 27th to the 30th! For camp, hotel and pricing information, check out the video flyers! Well Jan came and went like a flash. I hope all of you are still working hard on your eating habits and your physical fitness. Feb is upon us and there are some great things happening. Now is the time to push yourself and get involved and begin your journey and make improvements. Don’t wait, time goes by way to fast. I think it is important to mention we all thought we had nothing but time training with professor so often. It was in a blink of an eye and he had gotten sick and then in such a short time he passed away. None of us have the ability to know what the future will bring, don’t postpone things for tomorrow!!! I am very excited these next couple months are full of all kinds of great events. For starters we now have a personal trainer at the dojo, he and Greg are teaching a strength and conditioning class tues and fri at 6pm It is called Fit Happens . We have a workshop on sat feb 9th the focus will be ground fighting. I am also offering 6 slots for ½ private lessons at a discounted rate of $35.00 for the half hour. This is on a first come first serve. I am super pumped we have the M.A.C.H. Camp and seminars up and running again they are fantastic no matter what your skill level is. Please check the calendars for these events. IN THE NEAR FUTURE I WILL BE OFFERING FRANCHISE PROGRAMS FOR THE M.A.C.H. PROGRAM. If you are interested in that you will have to contact me there is a lengthy interview process as well as training process involved. So as you can see there are a plethora of great things going on with our awesome school. The focus for the next couple months in class is going to be on foundational skills, We are going to spend a ton of time on the beginning stages of Arnis to improve are base . In the advanced class we are going to be concentrating on how to make things flow. One of the last things I would like to talk about is dedication . To each person or student this has some different meanings depending on where each student is in their journey. I want to relate a story that I was told while I was in Germany at the Best of the West camp. A young man came into the gym carrying a bunch of stuff, I thought holly cow this guys moving in for the next couple of days. I didn’t pay much attention to where he went because I was very busy. The next day he was there at the gym when I got there. I noticed that a few folks had bedding and sleeping bags on the floor and they were putting their stuff away. As I watched a couple of these folks I observed them eating an apple and some bread and drinking some water. Later that day I was told from one of my students that the one student was talking about how important this event was to him, and how excited he was to be there. He mentioned that he only makes about $400.00 a month where he lives. The camp was $350.00 and it took 8 hours by train to arrive to the camp location. He spent his months wages on one camp. He slept on the floor ate minimal amount of food but thought that he was having the time of his life. I was sooo impressed with this actually got a chill thinking about the struggles this man went through to get here at this camp. He chose the camp over every day existence. I think about this when I hear all the excuses folks have about not coming to training, Some folks miss classes every week with no reason, others talk about time constraints, some talk about money. What I find so amusing is when the Test date for rank is posted people come out of the wood work. When they are denied or fail their test , the shock on their face is incredible. When I hear about Money I wonder what truly is going on. I mean I observe you go to McDonald’s spend 12.00 bucks on a crappy meal that you shouldn’t eat to begin with, or you go to Starbucks buy a $7.00 coffee how many days a week. I think back to the Man in Germany who had to use his months wages to work out one weekend, he slept on the floor ate minimal food just to get what he wanted. I think it comes down to priorities and dedication, and what you truly want. I hear folks every day,” man I cant wait until I get my black belt’, but those words ring so true more than most people ever know. You CANT wait , You expect your black belt for minimal time in and minimal effort, Like a drive though at burger king. I am sorry but you have fooled yourself into believing that this will work. The day that you chose to pursue the martial arts It began as way of life , some how people have been side tracked off the path. and a person who makes no EXCUSES!!!. I m asking everyone to be honest with yourselves and look at what you have done, and look at where you are now and where you want to be. No More excuses, no More missing training, no more’ ‘I will just do it next time’. The time is now to become the greatest that you can be.!!!! DEDICATE YOURSELF TO YOU. Be successful.!!!!! Train every class like it is the very last class that you can ever attend , give it everything you have ,don’t hold back. Please be inspired , push yourself there are no limits of what you can do!!!. See you on the Mat!!!!!!!!!! p.s. THIS was not directed to any one person, however if you feel it is, that means you need to take a close look at what you are NOT doing to become successful!!!!! Don’t take it personal and quit, take it personal and improve yourself on your views of dedication and what it is going to take for success!!!! I want to let everyone know, On Sat Jan. 26th I Have opened up 6 one half hour slots for private lessons. Two Slots have been spoken for, there are four slots left from 11:00 am until 1Pm. The normal cost is $50.00 for a half hour private. I have lowered the price for this special to $35.00 for a half hour private lesson. I will allow you to video the session as well. Looking forward to training , first come first serve sign up quick. Well 2012 was a great year. It was very humbling meeting so many great people in so many great places. I am really looking forward to what 2013 has in store for all of us. The New Year starts off with a bang, classes start up the day after New Years, and there is a work shop the first weekend Jan 5th Sat. from ten am until noon. This year I have some very lofty goals for myself, the school, and for all the students. I am hopeful leading by example will inspire everyone to become the best that they can be. Getting into good physical condition, improving dietary habits, and strong training regiments are on the menu to the road to success this year. I am very excited about the new web site, I hope that all of you have subscribed. Not only will there be the monthly news letter but there will be stories about Professor, technique of the month videos as well as all up coming events. Those of you who attended classes near the end of 2012, had a small taste of the training that we will be doing in 2013. There will be a lot of emphasis on technique development, and concept connecting. The other emphasis of course is going to be physical fitness, and combat applications in the advanced classes. The Kick boxing class is growing and we are very excited. There is going to be some changes to this program as well. We are going to do just kick boxing class, which is going to be more fight/self defense orientated, and a separate cardio class throughout the week. Please check the schedule for upcoming class changes and time slots. The last thing is I want to reach out to everyone who doesn’t have the ability to come and train at the dojo on a regular basis. Weather you are a student, or an instructor, or a school owner, there are many ways to get the knowledge and skill in Modern Arnis. I do have the availability for private lessons, these are scheduled to fit both of our schedules. There are work shops every month at the dojo on a Saturday. We have also been doing workshops in Wyandotte every other month. Please check the schedule for all the dates. The last way is, I am available for seminars /workshops, I also will help you implement a Modern Arnis program in your school. This will give you the ability to have a full curriculum based program to add students to your school or give your advanced students another challenge. 2013 has a lot of great things waiting for us. We have to stay focused, and committed to achieve all the greatness that’s waiting. Don’t be afraid of failure; be excited of the prospect of all the success. YOU ARE IN CHARGE OF YOUR FUTURE!!!!. Let’s have a great year, Be inspired, Try to Inspire others!!! Don’t forget no matter where you are someone is looking up to you for guidance!!! See you on the Mat let’s Make 2013 the greatest year!!! The school will be closed from Mon Dec 24th through Tue Jan 1st 2013. All Classes will resume tues. Jan 2nd 2013.